The Hawaiian island of Kauai offers an abundance of land and water adventures. Perhaps the most perfect adventure of them all is the Sacred Falls Paddle and Hike with Kayak Kauai. What makes it great? It combines kayaking, hiking, and swimming all in some of the most picturesque tropical scenery on earth. At first you might think that this tour is daunting. I want you to know that you don’t have to be an Olympic athlete to enjoy this adventure. On our tour there were kids of all shapes and sizes with ages ranging from about 8 to somewhere in their 60’s. There was one family spanning three generations in our tour group. The kayaking is pretty gentle and the hiking doesn’t require extreme elevation changes that get you huffing and puffing. After the logistics of checking in, the adventure launches at the south side of the Wailua River. What a beauty this river is! The river edge is surrounded by all sorts of thriving greenery from the river’s edge up to the surrounding mountain tops. I was particularly enamored with the twisted thickets of Hau trees lining the river. After the two-ish mile (or approximately 45 minutes) kayak up the river, you put out the kayak to begin the hike into the depths of a Kauai forest. The hiking portion is approximately one-mile long and as I mentioned, it’s not particularly strenuous. Along the way, we enjoyed the seeing the native trees and hearing the sounds of the waterfall and river. Just one of the many pleasant views from the hike to Secret/Sacred Falls. Your hiking is rewarded by arriving at a natural pool feed by a 100-foot, bridal-veil waterfall. The waterfall’s Hawaiian name is Uluwehi, but it commonly called Sacred or Secret Falls. Here, you can choose to take a swim in the refreshing waterfall-fed pool or you can park yourself on a boulder to be mesmerized by the waterfall. We opted for a little of both. Our tour included an excellent picnic lunch at the waterfall with wraps, chips, cookies and freshly sliced pineapple. After the dip and rest stop at the falls, you hike back to the kayaks and paddle back down the Wailua. Based on our excellent experience, I can recommend Kayak Kauai’s tour. The cost is $85 for adults and $60 for kids 12 and under. I felt like the quality of the stable kayaks, tour guide, and lunch were at a high standard in comparison to what I saw from other companies. By the way, the folks at Kayak Kauai “invented” this tour in 1988 per their website. Their guided tours are 5 hours long. Wear sunscreen and a hat or visor. Bring a swimsuit and towel if you plan to swim at the waterfall. Kayak Kauai provided a dry bag to store our towel and camera. Bring a camera that’s waterproof. Wear shoes or sandals that are designed for hiking in wet areas. For example, I wore these shoes and they were perfect. I never had to take them off, even when I went swimming. Do be careful with your footing over roots and rocks on the trail and the slippery boulders in the pool. I asked our guide if he thought there was a better time of day to go on this tour depending on the season. He seemed to think that in the winter, the afternoon tour tends to be better and dryer. In summer months, he said the morning tour might be the best choice as it’s slightly cooler. I’m “borrowing” the map shown below that indicates all the key points of this tour. Have you been to Kauai’s Sacred/Secret Falls? How was your adventure? I highly recommend visiting Wailua River. It’s a huge river considering the small size of the island. 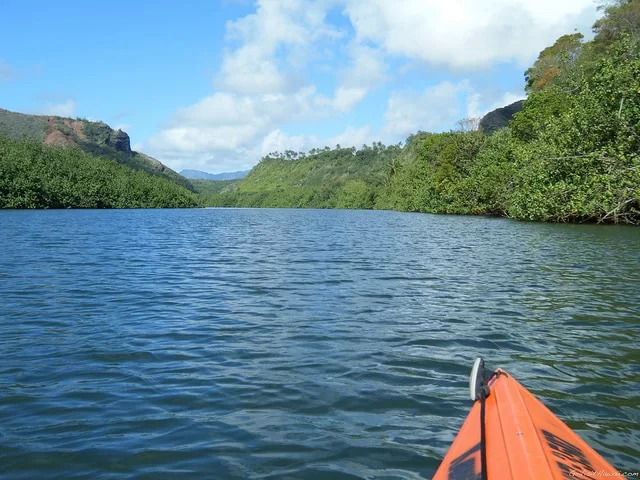 The reason why the river has so much water is because one of Kauai’s mountains receives the most rain than any other place in the world. Christian – Thanks for your comment and observation. It blows my mind to try to understand how one mountain on an island in the middle of the Pacific feeds so many rivers and waterfalls in Kauai. oh my goodness. That looks amazing! What a fun experience with out a lot of committment! We will have our 75 year old mom with us. She is very adventurous bus definitely slowing down. Do you think this would be too much of a strain for her? I thought if we put her on a tandem with one of us it might not be so hard on her, but still don’t want to do something too strenuous for her. Thank you for your great site! All the kayaks that we saw were tandem. The kayaking could be a little bit strenuous when paddling up stream, so if you pair your mom with someone who has good upper body strength, it shouldn’t be a problem. As far as the hiking goes, there’s not much elevation change. A walking stick or pole might be helpful for the hiking part. This is a great Kauai adventure. Have fun! Can you just hike to the falls rather than taking the kayak? Not to my knowledge…you have to kayak up the river to get to the hiking trail.